Tat Wong Kung Fu Academy in San Francisco, San Mateo, and Concord, California offers martial arts classes for children with specialized kid’s Kung Fu and self-defense classes. Our Children’s martial arts training program helps your child improve their confidence and physical strengths with our Kung Fu Kids classes for kids of all ages. We also focus instruction on valuable self-defense skills and strategies, as well as traditional martial arts qualities that help children become more focused, respectfull, and disciplined. For extra training in self-defense Kung Fu kids also have the opportunity to attend special self-defense seminars we offer students and as well on special occasions with a family member on our special mother's day and father's day self-defense work-outs, for example. For our intermediate and advanced Kung Fu kids we offer specialized seminars in specific areas of kung fu to hone their skills in self-defense applications, performance and competition techniques, lion dancing, and the traditional chinese martial arts open-hand and weapons forms. Students have the opportunity to learn the kung fu weapons forms from shaolin staff, tiger-tail sword, mui-fa spear, and more. We’ve structured a class curriculum that makes learning Kung Fu and self-defense fun while at the same time helping your child become healthy and fit, and more disciplined, focused, confident, and safe. Our Kids Kung Fu classes are taught by patient, encouraging, and highly skilled instructors so that children feel safe and happy to learn. Soon our Kung Fu kids gain the skills and benefits of Kung Fu increasing their focus, coordination, stamina, and overall confidence, which helps them in school and in life. 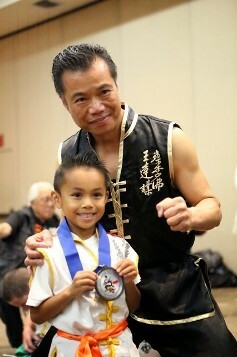 Each age group has a specialized curriculum that includes a step-by-step progression of self-defense techniques and kung fu skills. 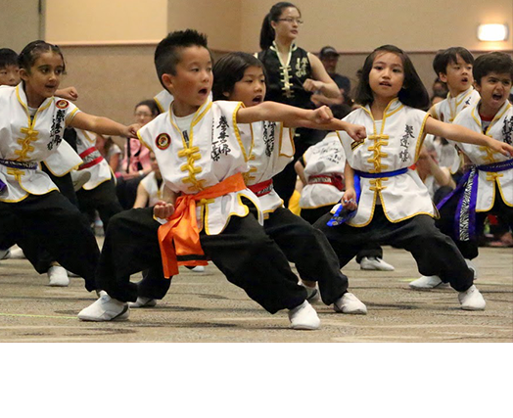 Students can also choose to gain more experiences in the traditions of Chinese Martial Arts by participating in workshops and extra-curricular activities such as parades, martial arts tournaments, performances, and Chinese lion dancing. Many of our young students have achieved awards in a range of martial arts competitions locally, nationally, and internationally. Others have also had the fun and experience of performing for local events and televised productions. Starting right from our introductory class, children and their parents gain insight into how we teach and get a great feel for the school's positive environment. Our curriculum in the on-going kung fu classes then guides children step-by-step through the technical material to develop their martial arts abilities in self-defense and traditional Kung Fu so they can improve their physical fitness, coordination, balance, strength and flexibility. For students who are not inclined towards team sports, the chinese martial arts taught at the Tat Wong Kung Fu Academy offers a great alternative. Often, children who've not been previously interested in sports are intrigued and interested in our kung fu training because of the comraderie our Instructors develop and because Kung Fu is unique and interesting mentally and physically. Kung fu is also interesting and unique for children who are athletic in other areas because kung fu helps increase coordination that will support improvement in other sports. Children not only learn the martial arts skills of kickboxing, self-defense, and traditional kung fu forms, they learn how to set and achieve goals, and how respect, focus, and discipline are important. Students' improved coordination translates into higher levels of confidence which in turn benefits all of their endeavors. With the great support from our professional instructors and staff our kung fu kids not only get in great shape they also learn to integrate the school's philosophy of Integrity, Kindness, Wisdom, and Bravery, into their lives. Our kids Kung Fu classes range from our Tiger Team classes for ages 4 through 7 to the Juniors Kung Fu classes for kids ages 7-12. Teens age 13 or 14 and up normally attend our Adult classes. Classes for children are then organized by skill level - kids beginner classes, intermediate, advanced, and black belt classes - are offered at convenient times throughout the week and on weekends. Your child will develop concentration, discipline, and respect, while building coordination, physical fitness, and self-defense skills in our safe, fun, and positive environment. Introductory kung fu and self-defense classes are scheduled at many convenient times throughout the week. Special work shops and seminars for self-defense and other areas of the training are also offered by age and level throughout the month and year. workout and intro class or get started right away with our online registration! See our Affiliates Page for other locations outside of California and the USA.